Unemployed people "are not statistics"
Tánaiste Eamon Gilmore hits back at Joe Higgins description of ‘Pathways to Work’ interviews for jobless as “Alcoholics Anonymous style” meetings. 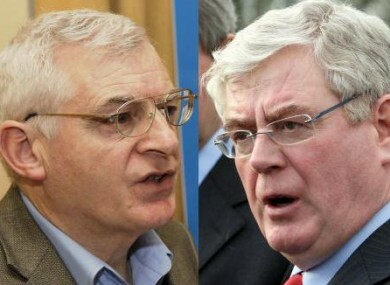 TÁNAISTE EAMON GILMORE has criticised Socialist Party TD Joe Higgins’s description of upcoming social welfare legislation as “lurid”. Higgins spoke about the proposed ‘Pathways to Work’ programme which was announced this month but has not yet been published. Earlier this month, in a speech in London, Taoiseach Enda Kenny described it as a “policy statement on labour market activation” which hopes to “prevents the drift into long-term unemployment”. In the Dáil this morning, Higgins said that he was concerned about some reports about the proposals, including the suggestion that unemployed people would be given a deadline by which they must have gotten off benefits and found a job or else face into “Alcoholics Anonymous-style meetings”. (A spokesperson from the Department of Social Protection told TheJournal.ie on Tuesday that Minister Joan Burton will introduce a “probability of exit” date for people on the dole). Higgins claimed that members of the Department of Social Protection had been known to refer to the plan as “Operation Transformation” legislation, after the RTÉ weight-loss programme. However, Eamon Gilmore criticised Higgins’s turn of phrase in relation to the legislation as “lurid” and insisted that people would be given individual interviews because “unemployed people are not statistics”. The interviews, he said, would help establish the individual needs, requirements and wishes of people to better assist them in returning to work. Joe Higgins claimed that the Government’s proposals would encourage a negative focus on unemployed people. He claimed that “there are certain billionaire newspaper owners” who he said would like to return to headlines such as those seen “in the 1980s” which he said classed unemployed people as “spongers on the dole”, “malingerers and the rest of it”. Poll: Should unemployed people be given a date to be off the dole? Email “Unemployed people "are not statistics"”. Feedback on “Unemployed people "are not statistics"”.